The “northernmost outpost of Southern culture”—that’s how a letter to the editor of the Daily Princetonian described the university in 1935. The letter was a joke (signed by “Jefferson Davis ’36” and four Confederate colleagues) but its sentiment rang true. For generations Princeton had had a certain Dixie flavor, in spite of lying farther north than Springfield, Illinois. More than 60% of Princeton undergraduates in the class of 1790 came from below the Mason-Dixon Line, and though the number fluctuated over the years, Princeton’s heavy concentration of Southerners lasted until the outbreak of the Civil War. In the years just before the Civil War, it was common for students to write in each other’s “autograph books” at the end of each academic year. These books provide a fascinating window into the friendships—forged amid great tensions—that marked that difficult time. John B. Mhoon (‘1859) of Tuscumbia, Alabama, later a Confederate major, expressed a desire shared by many Southern Princetonians to maintain his closeness to Northern classmates. As he wrote to John H. Rodney of Delaware: “If you ever come to Alabama, her green fields, and shady plains shall welcome you with the hand of friendship.” Such remarks would gain a deep poignancy as Northern armies marched South and war ravaged the landscapes of Dixie. Views were hardening. In his youth, Georgia Supreme Court justice Joseph Lumpkin (‘1819) joined the American Colonization Society—in which Princeton alumni and faculty played leading roles—but he later condemned emancipation and equated black people with the biblical Tribe of Ham, marked for servitude. Abolitionists were “fiends,” he wrote, and “humanism, which has so pervaded and poisoned the northern mind” would inevitably yield “a sea of fratricidal blood.” Fellow Georgian Alfred Iverson (‘1820), one of a remarkable 27 antebellum Southern U.S. senators educated at Princeton, gave ferocious speeches threatening secession. Other vociferous champions of slavery also attended Princeton. James McDowell (‘1816), soon-to-be governor of Virginia, gave an alumni oration in 1838 condemning abolitionism, that “destructive and mad philanthropy” that threatened to bring “a strife and a woe that may bury us all” in bloody slave revolts. McDowell’s florid lecture was quoted approvingly in Southern newspapers. Fellow Virginian Abel Upshur was expelled from Princeton for participating in the riot of 1807, a rebellion against President Samuel Stanhope Smith’s strict administration. Later, as U.S. Secretary of State, Upshur called slavery “a great positive good, to be carefully protected and preserved,” and spearheaded the annexation of Texas as a huge new slave state—until he died in 1844, blown up by an exploding cannon on the steamship U.S.S. Princeton. In the following decade, U.S. Supreme Court justice James Moore Wayne (‘1808) concurred in the 1857 Dred Scott v. Sanford decision that ruled black Americans had “no rights which the white man was bound to respect,” an inflammatory case that further pushed the nation toward conflict. Portrait of Abel Upshur, a Princeton student expelled in 1807, who later became a prominent proslavery politician. James Chesnut (‘1835) of South Carolina resigned from the United States Senate in Washington to help draft the Confederate Constitution. Present at the moment war began, he also delivered the final note warning Fort Sumter to surrender. History remembers him best for his wife, Mary Boykin Chesnut, author of a famous wartime diary. 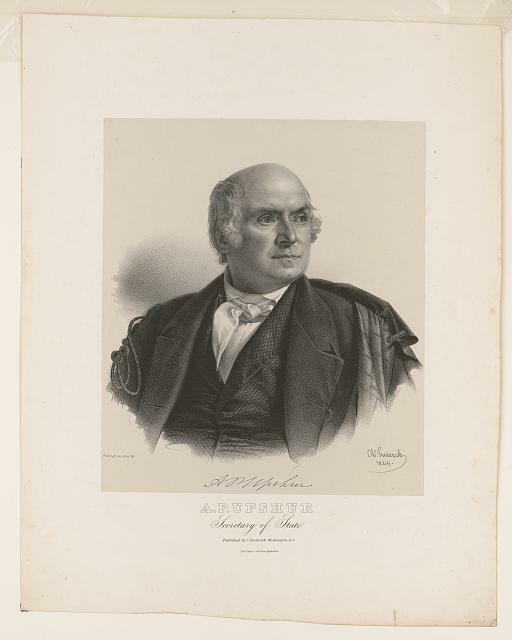 Alexander Boteler (‘1835), whose wife was Helen Stockton of the prominent Princeton Stocktons, reportedly helped design the Confederate flag and the Great Seal of the Confederacy. (Perhaps he inherited his artistic talent from his grandfather Charles Willson Peale, who painted Washington at the Battle of Princeton, which hung in Nassau Hall for more than two centuries.) At one decisive juncture, Boteler convinced his impetuous friend “Stonewall” Jackson not to resign from the Confederate army. Among several alumni in the Confederate Congress, Mississippian Henry Chambers (‘1844) took his seat after dispatching a rival candidate in a duel. Later he warned against the enlistment of black men as soldiers in the Confederate army, a contentious issue during the war. The last survivor of the Confederate Congress was also Princetonian, Jehu Orr (‘1849), who died in Mississippi in 1921. Recent research has turned up more than 600 Tigers who enlisted to fight in the Union and Confederate armies; more than half of them chose the Confederacy. For Northern patriots, there was reason to be suspicious of Old Nassau, whose alumni were deeply complicit in the rebel cause—as officers, soldiers, doctors, and spies. The 1862 Union assault on Richmond—also called the Peninsula Campaign—proved especially bloody for Princeton alumni. At least five Princetonians died in armies led by Confederate Robert E. Lee (son of alumnus “Light Horse Harry” Lee, class of 1773) and Union General George B. McClellan (future Princeton trustee). After enlisting with Confederate General William Barksdale’s Mississippi Brigade, Beach Reading (‘1863) was shot dead on the Peninsula in his first battle, at the age of nineteen. The following year, the battle of Gettysburg proved similarly fatal for Tigers. William McCaslan (‘1854) led an attack by Florida troops after Pickett’s charge. Having survived this exercise in futility, he rode back to Confederate lines with a fellow officer. According to one account, as McCaslan spoke of battles to come—glumly predicting that “it seems impossible to pass in safety through them all”—a cannonball hit and killed him. University of Virginia classics professor Basil Gildersleeve (‘1849) taught all winter then jumped into the saddle for summers with the Confederate cavalry. In September 1864 he was shot through the thigh in the Valley of Virginia, giving him a lifelong limp. He later wrote: “I lost my pocket Homer, I lost my pistol, I lost one of my horses, and finally, I came near losing my life.” This was not Gildersleeve’s first wound—as a student he had shot himself in the face while frog-hunting in Scudder’s Swamp in Princeton. While at Princeton, Gildersleeve had lived at 30 East College in a dormitory overlooking the cornfields of the Prospect estate. His freshman roommate James Lee (‘1849) went on to write a military manual, The Volunteer’s Handbook, that sold 20,000 copies after its publication in Richmond in 1860. Lee was mortally wounded at First Bull Run. Virginian Peyton Randolph Harrison (‘1851), Gildersleeve’s senior-year roommate, also lost his life at First Bull Run. His brother, the Reverend Dabney Harrison (‘1848), felt obliged to honor Peyton’s memory by enlisting in the Confederate army. At Fort Donelson, Tennessee, Dabney Harrison dragged himself from his sickbed, led soldiers in prayer, and then died in a cavalry charge. Princeton men occasionally encountered each other in unlikely ways during the war. When the Pennsylvania cavalry came through the town of Canton, Mississippi, Union officer Rowland Cox (‘1863) took up residence in a plantation home. By strange chance it turned out to be that of his classmate, Benjamin Ricks (‘1863), who was away fighting for the Confederacy. In neighboring Rolling Fork during the spring of 1863, medical doctor William Chaney (‘1852) received word that a Yankee gunboat was creeping up a nearby river. The owner of a fast racing rowboat, he secretly had two slaves paddle 80 miles downstream to warn the Confederate forces there, led by General Allen Thomas (‘1850). At the time, 600 U.S. marines were bivouacked on Chaney’s lawn. Overnight, he positioned sharpshooters in the surrounding trees. When they opened fire at dawn the federals fled to their gunboats, Chaney’s efforts helping to delay Vicksburg’s eventual fall. For a time Chaney also served the Confederate army as a surgeon—as did Joseph Jones (‘1853), whose wartime report on the illnesses raging in Georgia’s infamous Andersonville Prison was the first to identify the terrifying flesh-eating disease now known as necrotizing fasciitis. One of Princeton’s highest-ranking Confederate officers, Major General William Wirt Allen (‘1854) was shot while waving a saber to rally cavalry troops at Murfreesboro, Tennessee. Holding high the mangled remains of his hand, he shouted to his men, “Avenge this!” Allen survived the war, and his bullet-torn uniform and battle-flag were placed reverently in the cornerstone of the Confederate Memorial Monument in Montgomery, Alabama. One of the most prominent Marylanders to support the Confederacy, General Bradley Johnson (‘1849), led troops northward across the Mason-Dixon Line in July 1864 for the last Confederate raid into Union territory. He was present at the burning of Chambersburg, Pennsylvania—considered a war crime by contemporaries—where an eyewitness called Johnson “most vindictive and merciless.” On a previous incursion through Maryland, Johnson had ordered his own house torched, since he never expected to live in the Union again. After the war, many Confederate veterans returned home to ashes. To punish Alexander Boteler (‘1835) for serving in the Confederate Congress, Union soldiers burned his West Virginia plantation even as his tearful daughter ran back inside to play her piano one last time. In New Bern, North Carolina, the home of Frederick Roberts (‘1855) was also destroyed. His undergraduate photograph album reappeared in his mailbox more than 30 years later, returned to him by the daughter of the New Hampshire soldier who had stolen it. Despite their wartime losses, ex-Confederates worked diligently to undermine Reconstruction and mythologize the Lost Cause. In 1867, Joseph Hodgson (‘1856), editor of the Montgomery Daily Mail in Alabama, coined the derogatory term “carpetbagger” to describe Northerners who moved to the former Confederate states after the war. Joseph Williams (‘1852), who formerly owned slaves on five Florida plantations, organized vigilantes to “protect the purity of the ballot box” by intimidating Republican voters. John Reed (‘1854) established a branch of the Ku Klux Klan in Georgia to ensure that “permanent victory perched upon the banners of the white race.” Accordingly, the all-white electorate soon chose wealthy plantation owner and unrepentant Confederate Alfred Colquitt (‘1844) as their governor. Sixty-two names of Princeton dead were engraved in the Memorial Atrium in Nassau Hall in 1921-22. “Strangely enough,” the Confederate Veteran noted, “there are 31 from each side.” But many Southerners had been left off, perhaps deliberately understating the rebel affiliation of so many of Princeton’s sons. More names were added through 1939, bringing the total to 70. The memorial’s count continued to remain virtually equal: 34 Northern and 36 Southern. This supposedly even split remains an enduring campus legend, and for decades Orange Key tour guides (claiming an incorrect 35–35 tally) pointed it out to visitors several times daily, not realizing its fundamental falseness. In fact, 86 Princeton alumni died during the Civil War—with 48 of them having fought for the Confederacy. Princeton was more “In the Confederacy’s Service” than any of us imagined. Maynard is the author of the award-winning books Woodrow Wilson: Princeton to the Presidency and Princeton: America's Campus. Harvard and Yale explored their Confederate connections just prior to the start of the Princeton and Slavery Project. Some of their findings have been published in: Nathaniel C. Hughes, Jr., Yale's Confederates: A Biographical Dictionary (Knoxville, TN: University of Tennessee Press, 2008) and Helen P. Trimpi, Crimson Confederates: Harvard Men Who Fought for the South (Knoxville, TN: University of Tennessee Press, 2010). Princeton students of the Civil War era are listed in a series of University catalogues, including Princeton University: Catalogue (1896), making these an essential source, but researchers should be advised that they are filled with errors and omissions. Using the resources of Mudd Manuscript Library, I compiled a list of as many Princeton Civil War soldiers I could find, going beyond those that the University had itself compiled in 1920 for the construction of Memorial Atrium in Nassau Hall. My list showed, for the first time, that Princeton Confederates had been under-counted and hence omitted from the memorial wall. Princeton University Archives staff have definitively proven the extent to which veterans in general and Confederates in particularly were under-counted. Early efforts to understand Civil War-era Princeton appear in: Varnum Lansing Collins, Princeton (New York: Oxford University Press, 1914) and Thomas Jefferson Wertenbaker, Princeton, 1746-1896 (Princeton, NJ: Princeton University Press, 1946). The Historical Society of Princeton presented a useful exhibition, “Princeton During the Civil War” in 2006, followed by “’Your True Friend and Enemy’: Princeton and the Civil War” at Princeton’s Mudd Manuscript Library in 2012. In researching Princeton’s Civil War soldiers, I found various class books especially helpful. 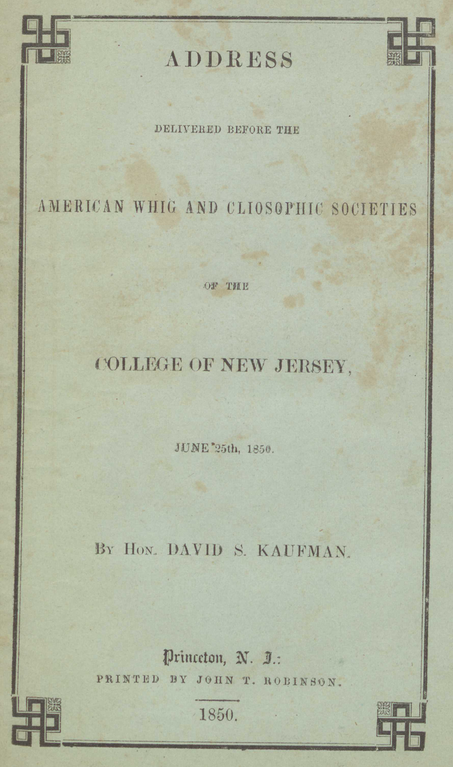 These included Records of the Class of Sixty-Three: College of New Jersey (Princeton College, 1867) and Princeton, Sixty-Three: Fortieth-Year Book of the Members of the Class of 1863 (Albany, 1904). Various Princetonians of the Civil War period may be found in the American National Biography database and such state-focused resources as Biographical and Historical Memoirs of Mississippi (Chicago: Goodspeed, 1891) and Lyon G. Tyler, ed., Encyclopedia of Virginia Biography (Baltimore: Genealogical Publishing, 1998). Autograph albums of the Civil War period, which give evidence of relationships between students from the North and South, are discussed in Alexander P. Clark’s article: “‘Princeton Memories with a Golden Sheen’: Student Autograph Albums of the Nineteenth Century,” Princeton University Library Chronicle 47, no. 3 (Spring 1986), 301-16. One of the fullest biographies of a Princeton-educated Confederate is Ward W. Briggs, ed., Soldier and Scholar: Basil Lanneau Gildersleeve and the Civil War (Charlottesville, VA: University Press of Virginia, 1998). Another is Charles S. Adams, Alexander Robinson Boteler, Wheel Horse of Whiggery, Stonewall’s Courier (Charles S. Adams, 1998). A recent source on college campuses in the lead-up to the Civil War is Alfred L. Brophy, University, Court, and Slave: Pro-Slavery Thought in Southern Colleges and Courts and the Coming of Civil War (New York: Oxford University Press, 2016). Princeton graduate Jennifer Epstein’s thoughtful senior thesis, “Slaves and Slavery at Princeton” (2008), provided an early treatment of Princeton’s historical links to slavery.